J. I. Packer (1926–) is known primarily as a writer, theologian, and professor; however, throughout the majority of his career, he was a preacher dedicating himself to the training of theologically astute church people. Having stood in hundreds, if not thousands, of pulpits and classrooms throughout the world, Packer has been an influential voice in the theory and practice of homiletics from a historically grounded, theological perspective. For Packer, preaching is teaching. There is much in Packer’s views on preaching that is nontraditional. For example, when Packer was asked in an interview what advice he would give to young clergy, his reply was that they “have three priorities: teach, teach, teach.” The weakening of churches is a result of their failure to teach the confessions and doctrine. “The preacher is, indeed, half of his sermon.” This statement is not intended to endorse the modern personality syndrome of celebrity preachers but is a call for authenticity in preaching and the recognition that their lives validate, enrich, and give evidence to the things that are said behind the pulpit. Packer advocates for an approach to application based on three principles. “Application should constantly focus on the unchanging realities of each person’s relationship to God.” In other words, the Scriptures must come to bear on our relationship to God Almighty, specifically as it applies to our faith, obedience, and holiness. “Application should constantly focus on the person, place, and power of Jesus Christ.” Given that Christ is the focus of the Bible, preachers ought to show how Christ is the answer to their deepest needs. “Application should constantly search the consciences of the hearers.” Whether congregants are unconverted, young Christians, or mature Christians, the sermon is intended to reach as many people as possible. 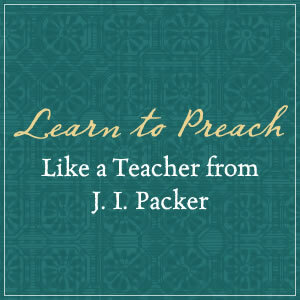 For Packer, preaching is teaching. More specifically, preaching is teaching the Word of God. In a Preaching Today interview, Packer was asked to respond to a prevalent contemporary view, namely that the sermonic emphasis that has been around since the Reformation is part of the problem with the church today. Packer refused to budge an inch. He defended Calvin’s view of preaching as “God’s derivative word,” based on a conviction that “Scripture should always be preached and listened to, read, reflected on as the word of the God who here and now is saying what Scripture says.” Perhaps this is the greatest lesson to be learned from this teacher of preachers—read, hear, and proclaim the Word of God as the words God says. — by Leland Ryken and Benjamin Hernández, adapted from the new book A Legacy of Preaching, Volume Two: Enlightenment to the Present Day, The Life, Theology, and Method of History’s Great Preachers. Don’t miss Volume One spanning the Apostles to the Revivalists, and the Legacy of Preaching Two-Volume Set. The series editors are Benjamin K. Forrest, Kevin L. King, Bill Curtis, and Dwayne Milioni. A Legacy of Preaching, Volume Two and Volume One (both release 11/13/18) tell the story of preaching, bringing great preachers of the past to life and instructing us through their unique approach to preaching God’s Word. This resource will help pastors, homiletics students, and scholars enrich their own understanding and practice of preaching by looking at how the gospel has been communicated over time and across different cultures. Taken together, volumes one and two profile sixty preachers including Paul, John Crysostom, Augustine of Hippo, Francis of Assisi, Martin Luther, John Calvin, Jonathan Edwards, John Wesley, Catherine Booth, D. L. Moody, Dietrich Bonhoeffer, John Stott, Martin Luther King Jr., Billy Graham, and many more. Enrich your theology and practice of preaching: Order the two-volume set today (releases 12/11/18) for the best value.